Blog > Uncategorized > What Are The Latest Kitchen Trends? What Color Cabinets Should I Consider? HGTV lists grey cabinets as their #1 kitchen trend. This national trend is also heavily seen in the San Diego market. We have found that grey can be just as neutral as white or beige, but with a more modern and contemporary flair. Don’t be afraid of a light grey color pallet for your kitchen! We can pair this cool neutral with natural wood floors or a dark stained kitchen island in order to create warmth and contrast. With a timeless and elegant appeal, grey is the new white! We also see the mixed use of black and white, to form a simple yet striking color pallet. This color combo can span vintage, modern, or even industrial design. It is so versatile, any home can pull it off! What if you prefer wood grain cabinets instead of paint? No problem! 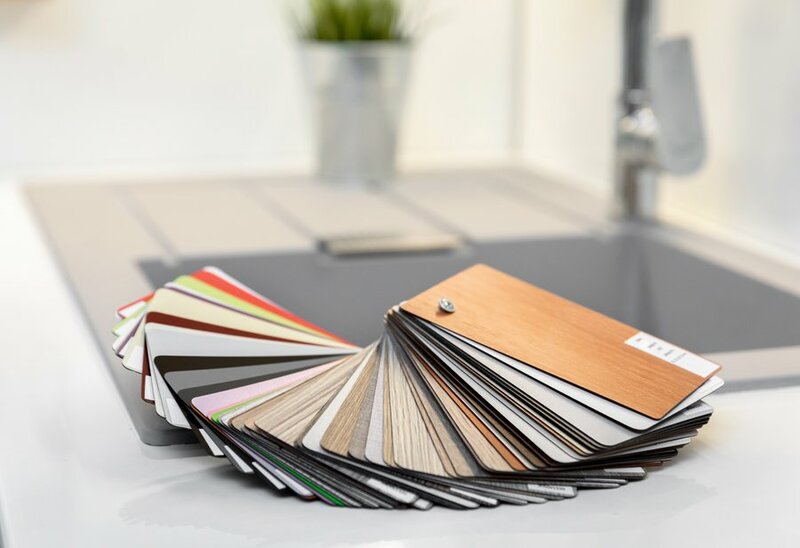 There are so many stains and wood species that can leave your new kitchen feeling fresh and modern without abandoning the look of natural wood. Try a grey wash stain, instead of a grey paint. This will enable the beautiful natural grain to telegraph through, which still staying cutting edge by using grey tones. Dark espresso stains are also still very popular. These dark rich colors are still very neutral and allow for any type of color scheme to come to life. Try using dark stained wood cabinetry as an island or feature area in the kitchen to bring contrast and warmth. Textured veneers are an emerging trend. These products can be natural wood, exotic wood species, and even synthetic materials like thermofoil and melamine. The surface can be smooth to the touch while showing vertical or horizontal grains or have an actual texture that can be both seen and felt. The colors range from warm natural wood tone neutrals, to grey washes, to dark wenge and espresso finishes. When it comes to lighting, the sky is truly the limit! Dress up a kitchen island with fun, glitzy pendants for a touch of glam. Or, use black metals and irons to bring in just a touch of industrial modern or farmhouse warmth. Large scale pendants are popular in kitchen spaces, while mini pendants are emerging as a fun twist to bathroom sconces. Feel free to mix metals when selecting lighting. Even if the hardware throughout the home is industrial black, the lighting features can range from polished chrome, to matte gold! Other unique finishes like winter gold and mercury glass are emerging as alternative choices to an already endless array of option. We see the use of crystal in both the traditional space and the contemporary. Lighting is a great way to bring in character and trendy elegance. Don’t be afraid to branch out and try something new!